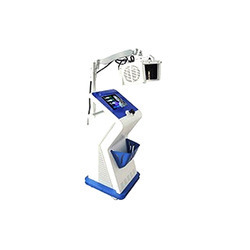 Manufacturer of a wide range of products which include hair growth machine. 240 pcs 670nm red laser, 140mw each laser module. Four zones physical design hair mask. Separate radiator module ensure long use life. Laser classification: Class 1M (safest rating). Medical grade Treatment so Enhances your image and boosts your confidence. Increases blood flow which in turn increases hair growth in follicle still capable of producing hair. Stop hair loss in 85% of patients regulates sebatious gland activity, for people with overly dry or oily scalp. Repair damaged hair shafts ,increase thickness of individual hairs by up 25% per hair providing much thicker and fuller appearance. Relieves itchy scalp conditions. Safe, effective and painless procedure. Use machine with under medical Supervision.